buttonhole-band includes lovely buttonholes. The neckband, cuffs, and bottom skirt feature snake cables as well. Most wrong side rows are worked by knitting the knits and purling the purls. All the motifs in this design are made of two-stitches-wide cables. The pattern includes a list of abbreviations, photo how-to on Cable Cast-on and Bound Off Braid onto knitting. There are 5 sizes included in the pattern. 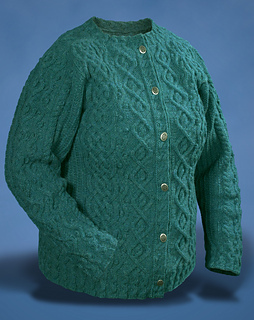 IN addition to the gauge stated, there are two other gauges listed in the pattern, based on other cables in the cardigan. 6 to 7 5/8” buttons are also needed.